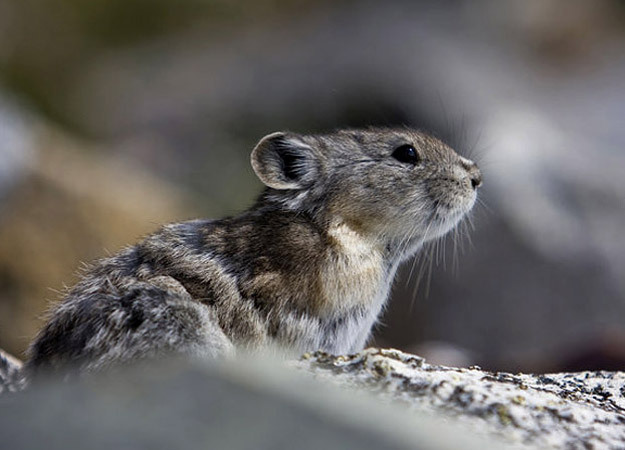 The collared pika is a small, furry mammal, with rounded ears and no tail. It looks like a mouse, and is not much bigger, but is actually related to rabbits and hares. Pikas live on rocky mountainsides and can withstand the cold – they don’t hibernate so they need enough food to last through the long winter, and they spend the short summers in a frenzy of activity, collecting summer flowers, grasses, shrubs, twigs, and lichen for their stores. Mouths stuffed full, they race back and forth all day to their rock crevice homes to add to their growing stockpile, taking only short breaks between shifts. To see them through the winter, they must collect fifty times their own body weight in vegetation.